It’s no secret that “Emotional Traffic” has been stuck in legal traffic for a few years now. But finally on January 24, 2012 Tim McGraw releases his much anticipated “Emotional Traffic” album. The release marks McGraw’s 11th studio album and his last for Curb Records. But let’s not drag this out any longer. The legal dust has settle, “Emotional Traffic” is finally available. Tim’s calling it”my best album ever”, so let’s take a listen. Fans that have had the opportunity to catch Tim in 2011 on his “Emotional Traffic Tour” may be familiar with some of the album’s tracks already. But for those tuning in for the first time, the album has already raked in a three week’s in the # 1 spot first release “Felt Good on My Lips”. It’s a signature playful McGraw tune that made an obviously good hit at radio and the concert circuit. And has been digitally certified Gold. “Better Than I Used to Be” is the album’s follow-up single. And while Sammy Kershaw did a fine job of previously recording it, this tune has McGraw written all over it, vocally, emotionally and lyrically. With an opening stating “I know how to hold a grudge . 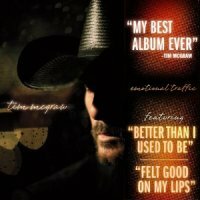 . . ” and a chorus that confesses “I ain’t no angel // I still got a few more dances with the devil // I ain’t as good as I’m gonna get // but I’m better than I used to be” Tim nails it with the depth of emotion that McGraw fans have come to expect from a signature McGraw tune such as this. But Let’s Start at the Top . . .
“Emotional Traffic” may be the album’s title but if that conjures up images of melancholy heaviness, tune in because you’re in for a sweet surprise. “Halo”, the album’s opening track is a little dark and heavy, shining down on the reality of a love that can’t be resurrected. While it’s a heavy emotional opener, it quickly reminds us of the power of McGraw’s vocals to transcend a lyric by virtue of his creamy vocals to having you feel every word and emotion necessary. Co-written by a favorite singer-songwriter-peformer and stellar musician, Jedd Hughes, gives “Halo” a thumbs up in my book. “Right Back Atcha Babe” is a familiar tune to anyone who caught Tim on his “Emotional Traffic Tour” as Tim took this tune along on tour with him. It’s a fun, foot-stomping, crowd-pleasing uptempo that’s a complete contrast from the album’s opener with a bridge teasing “if what goes around comes around // you got it made”. Now, how many ways can you bid farewell to lost love? Ask a country artist. But McGraw takes another shot at measuring what went wrong in “One Part, Two Part”. It’s melodically catchy and sure to grab your attention. A bit sweet and poppy for Tim I think but a foot stomper that will definitely stay with you. The “Barely Famous” Warren Brothers join McGraw and Martina McBride and pen “I Will Not Fall Down”, an inspirational uptempo suggesting one not give up, no matter the odds. It opens with a classic McGraw sound and grabs your attention with its signature McGraw vocals. The Warren Brothers step in again joining Angie Aparo at the pick with “The One”, paying tribute to “the one that makes you feel like I’m the one”. This is a playful uptempo sure to repeat in your head and liven up the crowd. It’s also, I think “The One” that would have been the vocally wiser duet choice with Ne-Yo than “Only Human”. Not that “Only Human” isn’t a good track. It is. In fact, it’s a phenomenal track. It’s so signature McGraw that when the tune opens up you are immediately enveloped by the richness of Tim’s vocals and “taken” into the depths of this song in lyric, melody, vocal and emotion. It melodically starts off a bit reminiscent of “Dance With Me” but Tim takes over and immediately makes it his own. It’s also the track where the album gets its title, the only place you hear the phrase “Emotional Traffic”. But unfortunately, I think, when Pop/R&B Ne-Yo takes his feature spot at the mike the entire song changes. The vocal range between the two singers is in such contrast that the song loses the depth that Tim created. I found it a bit unsettling because this song is so McGraw that you are truly thrown off in story and mood when it vocally transcends in duet. Now, before you start sending me hate mail, I am in no way saying Ne-Yo isn’t a good singer or has lousy vocals. What I’m saying is the way McGraw’s vocals and emotions open up this signature track, set you up and set you deep, and the too-much-of-a-vocal-contrast in duet choice for “this track”, disappoints rather than compliments it. I look forward to hearing this live and solo on Tim’s Brothers of the Sun Tour. Solo, I think this coulda been a killer single for Tim. As a duet, the mood changes in the song and, well, sorry, that’s just me ! I think “The One” would have been a better duet choice for this pair but we’ll see what happens. So Where Were We . . . Okay. Now, if I haven’t totally lost you here due to “my” opinion of duet “song choice”, let’s continue on and get back to business. I mean, this is a phenomenal album with a few pops and a lot of signature McGraw sound. So, where were we? Tim’s “Better Than I Used to Be” (no pun intended) is the album’s second release as a radio single. It’s doing well on the charts and I’m sure we’ll be seeing a vdeo soon. Previously recorded by Sammy Kershaw, the track has more “McGraw” to it than “Kershaw” if you ask me. The piano opening slows things down and opens up to a familiar sound McGraw fans are accustomed to. Tim just immediately owns this when he puts his vocal stamp on the lyric, “I know how to hold a grudge // I can send a bridge up in smoke” and reminds you in the chorus, “I ain’t no angel // I still got a few more dances with the devil.” It’s a vocal shot of whiskey that showcases McGraw’s well-rounded artisan-ship more so than the candy coated pop shots the business tries to slip you at the bar. “Touchdown Jesus” chases “Better Than I Used to Be” and again is a signature McGraw ensemble. An inspirational tapping of faith without being heavy, this one’s quite reminiscent of what we’ve come to know, like and expect of a McGraw delivery. Nicely done, I’m rootin’ for this one. Cowriters Joe West and David Pahanish (Right Back Atcha Babe) return to the songwriting credits with “The One That Got Away.” The song pays an inspirational tribute to those that stick to their guns amidst a lack of support and forge ahead staying focused on their dreams. “Hey Now”, no pun intended but I’ve got to give Tim’s good friends Brett and Brad Warren (The Warren Brothers) credit. They are all over this record. And they join Jim and Brett Beavers (The Beavers Brothers) with whom they also penned Toby Keith’s “Red Solo Cup” and co-write “Hey Now”, an uptempo play with romance at the close of a bar-boring evening as “she” walks in and McGraw announces “hey now // I thought the party was winding down // but look what I just found.” It’s a playful catchy melody that will definitely stick with you. “Emotional Traffic” winds down with yet another signature McGraw sound. “Die By My Own Hand” affords Tim plenty of opportunity to belch out both his vocals and emotions. It’s a Wrap . . .
Well, all told, tension and turmoil aside, Curb must be disheartened to be losing such a powerful voice. “Emotional Traffic” is a graceful way for this gorgeous voice to bid farewell to past partners. I look forward to hearing how “Emotional Tour” plays out when Tim joins musical forces with Kenny Chesney on the “Brothers of the Sun Tour” this summer. Until then, be sure to grab your copy of “Emotional Traffic”, Tim McGraw’s final farewell at Curb Records. And while you’re waiting for the “Brothers Tour” to begin, get to radio and help Tim move “Better Than I Used to Be” up the charts. Enjoy this gorgeous live version for now . . .